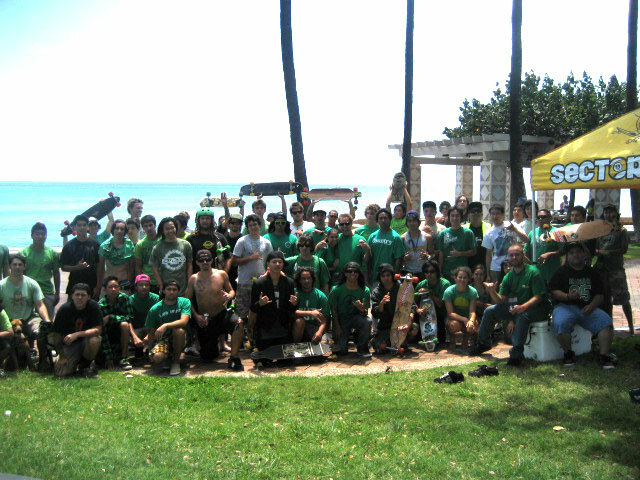 MAHALO everyone who came out for the 4th GreenSkateHawaii! We had about 50 skaters flooding the streets pushing from UH Manoa to Kakaako waterfront park and it was nothing but good vibes. 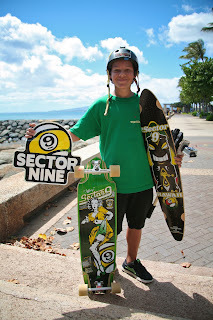 Thanks SECTOR 9 Skateboards and DaStick Honolulu for the support! EVERY SKATER LEFT WITH A PRIZE, you can't go wrong. The full write up and photos will be up soon so keep checking back! 4th Annual Green Skate Hawaii. Get ready to gear up for the 4th Annual Green Skate Hawaii because it's quickly creeping up! GreenSkate was put together in 2007 originally in Calgary, Canada and rapidly spread world wide. The goal was to set up a skate event on or around Earth Day that would raise awareness of THE SKATEBOARD... Using it as a alternative energy vehicle, a way to workout, and/or just have fun. Here in Hawaii, the past 3 years we have been meeting at the University of Hawaii and pushing as a group to Kakaako waterfront park using bike lanes, sidewalks and the right edge of the road. Once we get to the ocean... we bbq, have a little skate jam and get treated to some schwag thanks to our supporters. This year we will be doing it up again! Come cruise along on April 27th. Meet up at the University of Hawaii Manoa under the trees across from the old Yogurtland. We will be rolling out in route to Kakaako Waterfront park at 12 NOON sharp, so please show up early. Once arriving at Kakaako we will have a little skate jam/cruise and will be giving away some FREE prizes! All wheel turners are welcome, we just ask that you please be respectful to drivers/pedestrians while skating and please WEAR A HELMET. To keep the group united, we ask that everyone wear GREEN on the 27th. This year we want to give back to the community that we skate in even more! So we will be awarding PRIZES to those who pick up the most trash along the push. Trash bags will be available, BUT if you bring your own... you can show it the day of the push and get a FREE sticker! 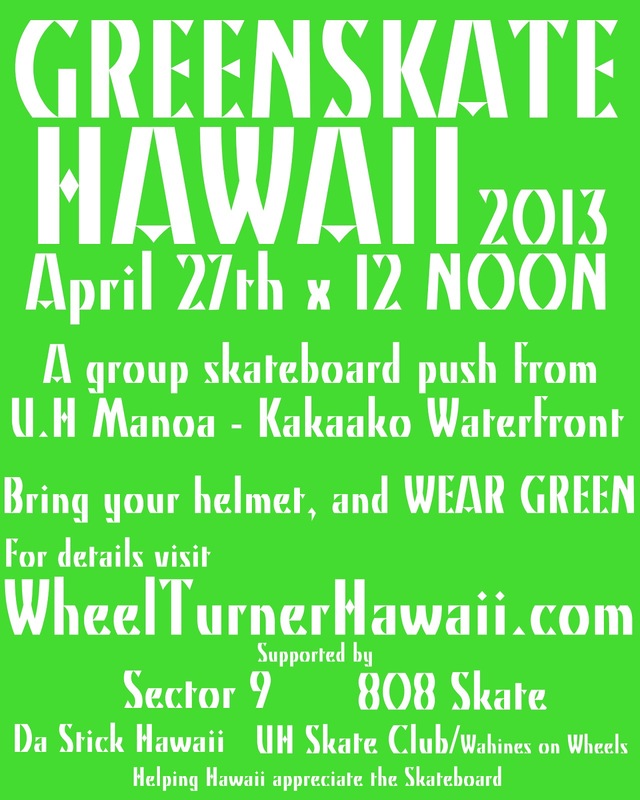 You won't want to miss GREEN SKATE HAWAII 2013. We will see you on April 27th... don't forget to wear GREEN.